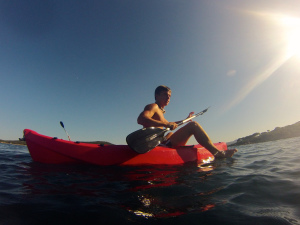 A family holiday in Sardinia, gave me the opportunity to try sea kayaking for the first time. The Mediterranean Sea, notoriously calm and accommodating for first timers, was a good place to start. I had previously spent a lot of time kayaking and canoeing on rivers, completing day trips, navigating white water and rapids and getting to grips with both types of vessel. We hired the kayaks for the day, from a local water-sports shop, and set about learning the techniques for this sport at sea.